I love to read as you all know; different types of books, genre’s, styles and authors. I love learning things and then reading a good love story to take me away from it all afterwards. 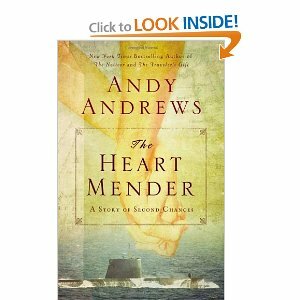 The Heart Mender is a great summer read for many reasons, but for me the lesson this book helped me with is forgiveness. I am not a history buff, really, I hate history so I have no idea why this book called out to me as bad as it did, but I am glad I read it now. I learned more about WWII than I wanted to know before I picked the book up. By the middle of it, I didn’t want to put the book down. What I didn’t want to learn was about the Germans and bombing the coastline in Mississippi and Alabama. I loved watching the story unfold from a simple tree, and then the author finding a picture and buttons. The story wasn’t pretty, but it did teach me that you can stay true to your values as a person, no matter who you are. It taught me about second chances though for me, that might be a bit harder of concept to learn in real life. Sometimes it is a bit too late because of the things you have had to deal with, but it is a concept that is nice if you can learn it! The one thing this story taught me is forgiveness Helen and Danny were talking about forgiveness. Danny stated that she needed to forgive a soldier for her. Helen said why’s that “Because whenever you get hurt by somebody, you can either think about em all day long and let em keep hurting you insideor give them to God. Give them to God? h-huh. If you forgive them, it doesn’t mean they get away with what they did it just means that you don’t have to think about it all the time. You can’t do anything anyway, except be mad. See? You just give em to God. Then you can be happy. If anything, that is what I will always take with me, and try to learn now! What a great read, from the beginning to the end of the story.It is one I will certainly pass on to others, in hopes they will be able to learn ONE thing from the story. I totally agree. This book was fabulous — well-written, engrossing, memorable. I loved it. Would like to read this book for lessons learned as well as story line.